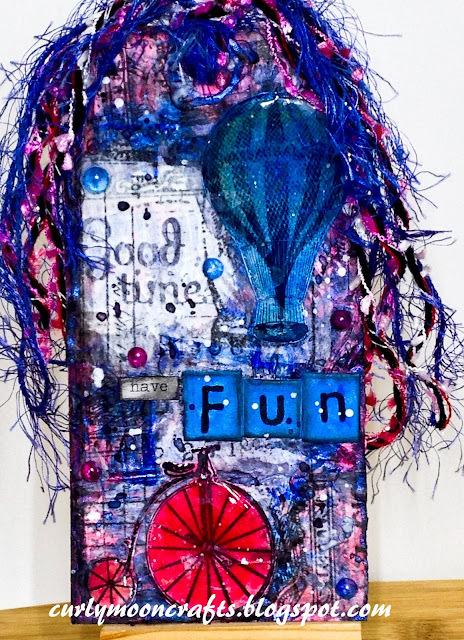 Hi Friends: Today's creation is another tag - Have Fun. It really was lots of fun to create. I started with a plain manila tag and covered it with washi tape. I covered with a layer of gesso, then added molding paste with a spatula and the Prima texture brushes to create lots of texture. Once dry, I dripped the acrylic inks onto the tag, added a spray of water & let them drip and move along the tag. When dry, I added a bit more gesso, then stamped "Good Times" into the whiter area. To create more visual interest, I stamped the word stamp around the tag, then covered the tag with strips of Tissue Wrap using gel medium. I added some LSG spray in Screamin Banshee Black and let it drip and move around the tissue wrap strips. I stamped the bicycle and balloon stamps onto white cardstock, fussy-cut them, then colored them with the same acrylic inks. When dry, I covered the stamped images with Liquid Embossing gel then glued the images to the tag. I colored some Alpha Tiles with the blue ink, then used rub-ons to spell the word "fun", and added them to the tag. To finish, I added some dew drops, some LSG ink and gesso splatters, then edged the words and tag with Black Soot Distress Crayon, and topped the tag with a few strands of fibers from my stash. 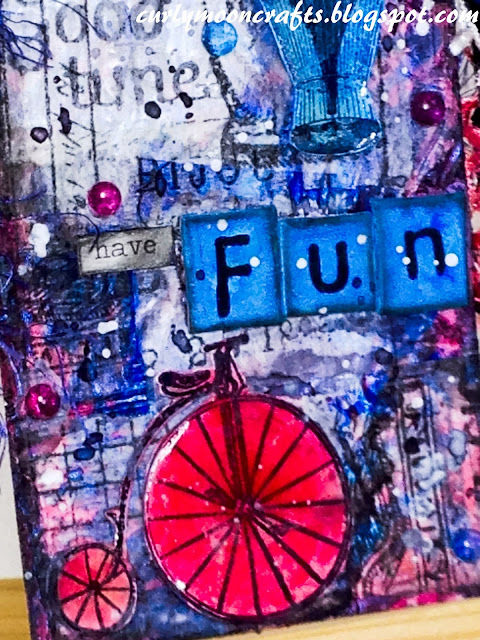 Hampton Art - 7 Gypsies stamps - bicycle + words + "Good Times"
Awesome textures and striking color combo! So glad that you join the fun over Simon Says Stamp Wednesday “Anything Goes” Challenge! Awesome details and design! Super work!